Jordan Brand is now introducing a line of retro Air Jordans mixed with the Nike signature Air Force 1. With the popularity of the Air Jordan line mixed with the classic Air Force 1 it’s a win win situation, literally. 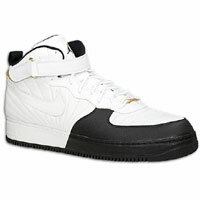 Jordan and Air Force 1 have come together to release the Jordan AJF 12 basketball shoe. The blend of the iconic Air Jordan and timeless Air Force 1 really turns it up a notch with the full-grain leather and nubuck upper that is combined with a classic, removable ankle strap. The midsole is wrapped in leather and combined with an internal Air-Sole® unit while the outsole features a circular traction pattern. This official collaboration between Jordan and Air Force 1 is sure to make heads turn for years to come. There are two other colorways available. Due to the fast demand of this product Team Jordan will be releasing more of your favorite retro Jordans remixed with Nike AF1. So be on the lookout for more info on Jordan Fusion Collection. Combining the best of two classics, the Jordan AJF 4 Men’s Shoe is an icon in the making with a sleek translucent sole and all the MJ style you know and love.